^ a b c "Kingdom Hearts Info". GameFAQs. Archived from the original on 2016-03-03. Retrieved May 12, 2007. ^ "Kingdom Hearts II Info". GameFAQs. Archived from the original on 2016-03-14. Retrieved June 14, 2007. ^ Anoop Gantayat (June 18, 2010). "Tetsuya Nomura on Kingdom Hearts 3D". Andriasang. Archived from the original on 2010-06-19. Retrieved June 16, 2010. ^ あなたの手の中に、『KH』の世界が法がる [The world of "KH" expands into your hands]. Famitsu Weekly (in Japanese). Enterbrain (1380): 30–35. 2015-05-15. ^ "Kingdom Hearts Unchained χ is coming to North America!". Square Enix. 2016-04-04. Archived from the original on April 4, 2016. Retrieved 2016-04-04. ^ a b c d "Kingdom Hearts Company Line". GameSpot. Archived from the original on 2007-05-18. Retrieved May 13, 2007. ^ Greg Kasavin (September 9, 2002). "Kingdom Hearts for PlayStation 2 Review". GameSpot. Archived from the original on 2007-05-02. Retrieved May 13, 2007. ^ Hirohiko Niizumi (July 29, 2005). "Kingdom Hearts vocalist returns for sequel". GameSpot. Archived from the original on 2009-05-23. Retrieved June 15, 2007. ^ "CDTV PowerWeb! : 宇多田ヒカル – 光". Tokyo Broadcasting System. Archived from the original on 2010-03-30. Retrieved June 26, 2007. ^ "CDTV PowerWeb! : 宇多田ヒカル – Passion". Tokyo Broadcasting System. Archived from the original on 2010-03-30. Retrieved June 26, 2007. ^ "Kingdom Hearts II's Tetsuya Nomura Q & A". GameSpot. Archived from the original on 2009-04-18. Retrieved June 8, 2007. ^ Gerstmann, Jeff (May 17, 2001). "E3 2001: Square announces Disney RPG for PS2". GameSpot. Archived from the original on 2011-06-28. Retrieved January 23, 2008. ^ Justin Calvert (September 26, 2003). "TGS 2003: Kingdom Hearts sequels announced". GameSpot. Archived from the original on 2009-05-18. Retrieved June 8, 2007. ^ a b Josh Freund (December 20, 2005). 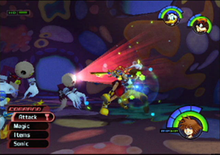 "News – Latest Famitsu review scores – Kingdom Hearts II, Mario & Luigi 2, & more". Gamesarefun.com. Archived from the original on 2011-07-09. Retrieved December 15, 2006. ^ "Famitsu review scores – First Kingdom Hearts 358/2 Days score". NintendoEverything. 2009-05-19. Archived from the original on 2009-05-23. Retrieved 2010-01-16. ^ Calvert, Justin (November 18, 2002). "October video game sales". GameSpot. Archived from the original on 2011-06-28. Retrieved July 5, 2007. ^ Tor Thorsen (January 31, 2005). "ChartSpot: December 2004". GameSpot. Archived from the original on 2007-09-30. Retrieved June 8, 2007. ^ Tor Thorsen. "ChartSpot: March 2006". GameSpot. Archived from the original on 2014-05-19. Retrieved May 15, 2007. ^ Reiner, Andrew (September 29, 2008). "Top 25 PlayStation 2 Games: The Games That Defined a Generation". Game Informer. Archived from the original on 2008-10-07. Retrieved March 23, 2012. ^ "Official Kingdom Hearts Website: News". Square Enix. Archived from the original on 2012-02-15. Retrieved May 14, 2007.